Craving delicious pumpkin recipes? I’ve got a secret… I’ve been going a little pumpkin crazy lately. Do you have any favorite fall flavors? What is the best fall dessert that you have to make every year? You know the one…fall is just not quite the same without it. I whipped up this Pumpkin Cream Cheese Filling that is SO perfect for many of my favorite pumpkin treats. You just can’t go wrong adding Pumpkin Cream Cheese Filling to a bagel, french toast, milk shake, or about a dozen other concoctions I’m sure you could think of. What creative treat would you make with Pumpkin Cream Cheese Filling? This recipe is adapted from the filling used in my No-Bake Pumpkin Cheesecake. The only difference is that the amount of pumpkin is cut in half. The Pumpkin Cream Cheese Filling recipe is designed to make enough filling to use for a few days of my favorite fall pumpkin filled recipes. If you’re not planning to use this filling a 2-3 days in a row, you would probably want to cut it in half. As is, the recipe makes approximately 5 cups. 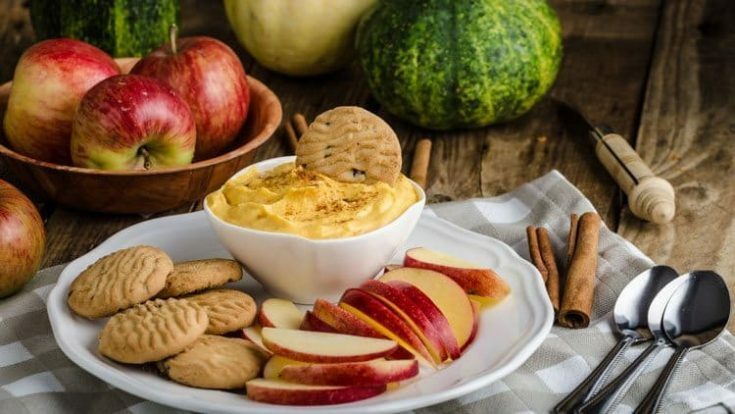 Whip together 2 (8oz) packages of softened cream cheese, 1 can sweetened condensed milk, 1 can pumpkin, 2 teaspoons vanilla, 1 teaspoon cinnamon, 1/2 teaspoon nutmeg, and 1/4 teaspoon ground cloves. I just made some of this to fill some spiced cupcakes with it is absolutely delicious! Thanks for the reciepe it was perfect. I have a question though can I freeze this filling if I have left overs? Thank you again for this wonderful reciepe keep up the great work and God Bless! That sounds amazing Amber! What a great idea. I’ve never done much with filling cupcakes, but this sounds like a great combination. I’m going to have to try it! I’ve been looking for this recipe to try. Every time I look it up I get this page but still no recipe. Thanks for the note. There was an error with that page, but it has been fixed and the recipe is back up. Best! No oven degree or time. Where is the rest of the directions???????? this is just a recipe for filling that you can use as a pumpkin cream cheese spread, in shakes, etc. It isn’t meant to be baked.